We caught up with MicroCare’s Tom Tattersall shortly after APEX to find out what was new with them and what their most demanding customers were asking for. EMSNOW: First of all, what was new at MicroCare for APEX? 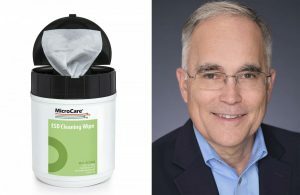 Tom Tattersall: MicroCare unveiled our new solder paste and flux cleaning test results at the show. Working in partnership major flux and solder paste manufacturers, we spent the last 18 months identifying which MicroCare cleaning fluids work best at removing residue, both at the bench and through the reflow oven, with their most popular fluxes and pastes. The MicroCare Critical Cleaning Labconducted controlled benchtop and automated vapor degreaser cleaning tests to determine which specific MicroCare cleaning fluids work best on the flux and solder paste materials from AIM, Alpha, Loctite, Indiumand Kester. op flux removers to further reduce customers’ cleaning costs. The jumbo size cans offer them a 15-20% savings per ounce over the smaller cans. Lastly, we were very excited to introduce our new team member, Ernesto Pollano, Regional Sales Manager, to our customers at the show. Ernesto will lead our sales efforts in Mexico. EMSNOW: You’ve always been the greenest in your sector, is that becoming increasingly important to your customers? Tom Tattersall: Being green and complying with regulatory requirements has always been important to us and to our customers. They have come to rely on MicroCare to provide products that meet both their critical cleaning needs as well as their specific regulatory requirements. That includes fluids for both benchtop cleaning and for higher-volume cleaning using a vapor degreaser. What we’re seeing today, particularly in Europe, are a host of new regulations being implemented. MicroCare has always been at the forefront of developing new products to meet new regulations, and this time is no different. We currently have products manufactured to meet those new stringent European environmental regulations and are able to continue to serve the European market. EMSNOW: What are the major trends impacting your sector and your technology roadmap and what industries deliver the biggest challenges? Tom Tattersall: One of the biggest trends that we continue to see is that people want more power in smaller circuit boards. That means PCBs with tighter spacing andhigher density. This miniaturization trend will continue to make effective PCB cleaning, to ensure the functionality and reliability the boards, more challenging. In addition, the need for new materials for circuit boards and higher-performing components is continuously on the rise. Manufacturers are also incorporating more fiber optics on circuit boards. The challenge for MicroCare is to stay ahead of this trend by developing cleaning fluids that will be compatible with those new materials but still clean as consistently and effectively as our customers expect.